On June 1st, along with 13 others, I completed the six-day 2017 National Famine Walk. 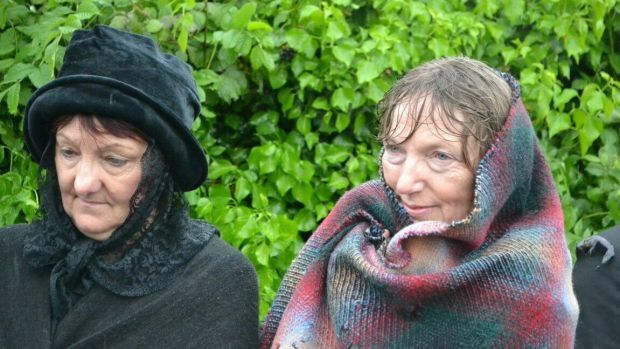 The 155km journey from Strokestown to Dublin Quays along the Royal Canal retraced the footsteps of 1,490 tenants who, evicted from Denis Mahon’s Strokestown estate in 1847, participated in Mahon’s so-called assisted emigration scheme. 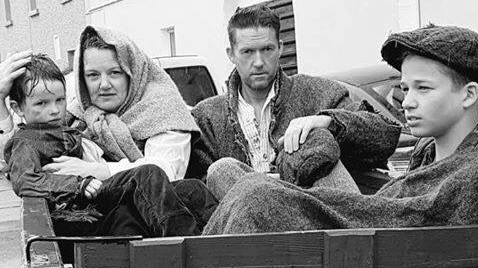 Participated is perhaps too benign a term for an assisted emigration that was a self-serving, mendacious act, a forcible removal from Ireland, as landlords, burdened by the 1847 Poor Law Extension Act requiring them to feed their tenants, decided it was better to be rid of them. 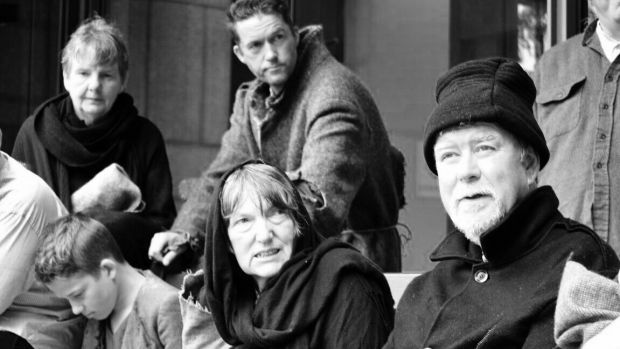 Most evicted tenants were marched to Dublin under the merciless, watchful eyes of officious bailiffs – a mordant assortment of Pied Pipers who, in executing their orders, flushed Ireland of her tenants like rats to the sea. America had always been the destination for most Irish emigrants. It would not be so in the fated year of 1847, as American authorities, anticipating the inevitable emigrant wave of Irish, enacted a series of Passenger Acts that effectively closed Eastern seaboard ports to stave off pestilence and disease. In a calculated counter-measure, absentee landlords summarily redirected emigration to Canada. Contracting with merchant sailing companies plying a trade between Canada and England, the infamous coffin ships – vessels which ordinarily would have returned empty to Canada – were hastily retrofitted to stow upwards of 500 passengers. One of Mahon’s three chartered ships, The Virginius, carrying 496 passengers, suffered a lost 158 souls. 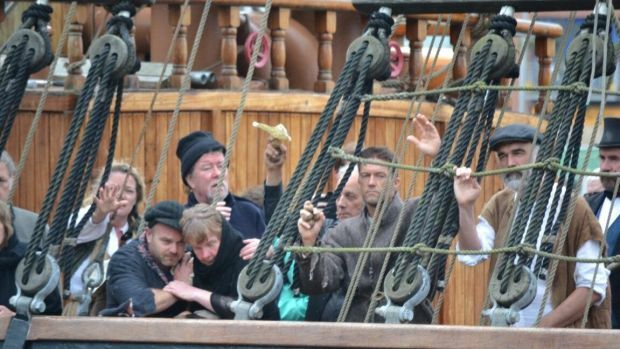 Crew members reportedly had to be bribed to drag the dead out with boat hooks. Half of the 1,490 who left Strokestown died. Attributing such losses to an ill-conceived assisted emigration scheme belies certain truths. In early May of 1847, at Canada’s emigrant processing facility, Grosse Île quarantine station, officials pleaded with British authorities to fund the hiring of extra medical personnel to accommodate what they anticipated would be refugees and not sound emigrant arrivals. All correspondence fell on deaf ears. By June, ships were backed up a mile along the Saint Lawrence. Typhus, colloquially referred to as ship’s fever, raged. Overwhelmed medical staff, amidst the miasma of disease boarded vessels, separated families and quarantined the infirm. Administrative bedlam ensued. Names were not always recorded, given so many expired in a state of delirium. By mid-summer over 5,000 victims were interred in mass graves at Grosse Île, while the upriver cities of Quebec and Montreal braced for an unprecedented season of disease. By July, 75,000 survivors of the Atlantic crossing descended on Montreal, then a city of 35,000. The heroic efforts of Montreal’s community – especially the intersession of The Grey Nuns, who endured devastating losses in ministering to the Irish in the dockland fever sheds and who eventually placed over 3,000 bereft orphans with Québécois families – has only recently come to light through the scholarly work of Irish Heritage Trust’s Dr Jason King and Dr Christine Kinealy, founder and director of Ireland’s Great Hunger Institute at Quinnipiac University. Collectively, the corpus of their work is reconstituting the definitive history of the 1847 passage to Canada. So, too, their partnering with the Irish National Famine Museum at Strokestown Park House and research into a trove of documents uncovered by Jim Callery, peerless philanthropist and owner of Strokestown Estate, is adding a compelling narrative to a desperate year of record evictions and emigration that saw Mahon’s murder and the expulsion of 11,000 of his 12,000 tenants. 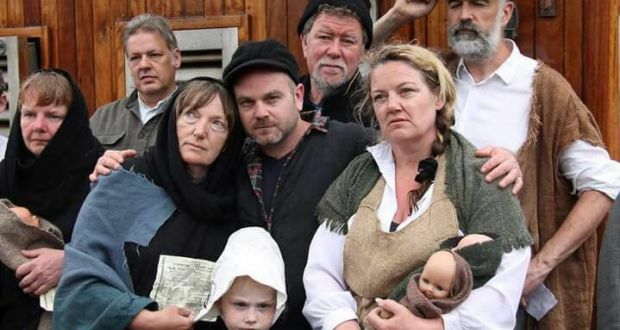 What differentiates Strokestown Famine Museum’s bi-annual National Famine Walk from other commemoratives is that it represents a microcosm of the greater tragedy, contextualising a finite 1,490 lives out of the millions who emigrated. Each of the 13 participants, walking in the footsteps of a Mahon-evicted tenant, was provided a brief biography of that tenant. Scholars, sifting through the Strokestown archives, are engaged in retracing all 1,490 emigrants with a plan to invite 1,490 descendants to return and walk the route from Strokestown to Dublin. It’s ambitious and emotive, but one sees within its far-cast ambition a needful endeavor to figuratively and literally put a face to 1847. In being assigned the emigrant James Flood, I felt the compunction to whisper, “love your children all the days of their lives, for they will surely die”. Of his nine children, three perished at sea. In the chaos of what ensued at Grosse Île and beyond, what remains in the historical records is a brief account of Flood’s son, saved by The Grey Nuns. He survived in the records until 1875. The grim reality is that within six years, most of those who survived the passage to Canada were dead. Such was the physical and psychological toll of an interminable passage and the undertow of such heartbreaking loss. My invitation to join the 2017 walk stemmed from my 2016 self-conceived 1847 commemorative pilgrimage – a marathon-a-day run that saw me retrace the emigrant journey from Grosse Île through the sectarian divide of two provinces, Quebec and Ontario. The 600-mile journey ended at Ireland Park, Toronto, amidst Ronan Gillespie’s haunting statues, reaching back to a counterpart installation on Spencer Quays, Dublin. In Quebec, the motivation to provide succor was Catholic kinship, while through Ontario, and especially in Toronto, municipal authorities marshaled medical resources and contingencies for housing refugees that became the gold-standard for disease containment throughout the 19th century. And yet, for all their heroic efforts, in the sailing season of 1847, Canada gained the infamous distinction of having the largest number of mass graves of Irish outside Ireland. In Montreal, a single stone monument, The Black Rock, erected after the unearthing of a forgotten mass grave of some 6,000 Irish in 1859, sits today in a busy thoroughfare. A memorial committee dedicated to the preservation of The Black Rock is seeking to build a park, which would be at once an Irish memorial and a transnational symbol, a cautionary reminder of what can and continues to befall the dispossessed and disenfranchised. Similarly, the Irish National Famine Museum in Strokestown, under the directorship of the indefatigable Caroilin Callery, envisions the eventual creation of a Famine university in Roscommon. In a broadening reach to examine and simultaneously extend the events of 1847, to codify Famine studies as a tragic trans-global phenomenon, Strokestown is moving beyond a legacy of incendiary sectarianism that once blighted Famine studies. Part of the essential purpose of the National Famine Walk, in its partnership with Strokestown Park House, the Irish National Famine Museum, and the Irish Heritage Trust, is to conjoin it with the trust’s commitment to bringing places to life, such as the Royal Canal. The restored Royal Canal, re-inaugurated by President Michael Higgins on the 200th anniversary of its opening, coincided with this year’s Strokestown walk. In addressing the walkers, the President reiterated his avowed commitment to reclaiming the Irish hinterland. In recognising the harrowing passage of those who left Strokestown Estate, he unveiled a nineteenth-century pair of shoes cast in bronze that is inscribed: “in Memory of the largest known group to have walked the full length of the Royal Canal – the 1,490 Strokestown Famine Emigrants in May of 1847”. On day four of the Walk, two amateur historians of the Hill of the Down, PJ Massey and Pauric Masterson, urged us to meet with 94-year-old Betty Doyle. Part of the story of the famine lies in a repository of local lore, and the walk, in passing where so many passed, is facilitating a conjoining of past and present. In a throwback 19th century cottage, a diminutive Betty Doyle, under the coaxing intimacy of Massey and Masterson, tapped a font of lore and poetic register that caught the sentiment of an older generation. I was mindful of Synge and his time on the Aran Islands with Yeats’s evocation that he put his ear to the floor to catch the cadence of the Irish voice. The most impactful of Betty’s stories was the memory of a “famine barley” which grew in small patches from grain in the pockets of those who had perished. One imagines this moribund harvest, this eerie memorial to those fateful years and to so many unburied dead. On the return to the canal, we stopped at the gurgling throat of a hidden famine well, dug for 4,000 rail workers. In standing amidst the dappled light, conjecture settled that perhaps it was here that emigrants stopped and worked a while, in a prefiguring of the rail work they would eventually undertake a continent away in the United States. In returning to Ireland, to begin again a journey that had ended a year before in Toronto, I felt an authorial omniscience, a plangent voiceover, a gathering account at journey’s end that inevitably cuts to how it all started. What was missing all along in my run through Canada was a point of origin – that first footfall, the corporeal presence of actual lives. I was granted it in standing on the grounds of Strokestown Estate in a communion with the souls of 1,490 emigrants who had begun a journey 170 years previous. If there’s a narrative thread to my Canadian run and The National Famine Walk, it’s the commonality of a tenacious insistence to memorializse the fateful years of The Great Hunger, perpetuated by ordinary people. Among the walkers was Mick Blanch, son of Michael Blanch, the famous taxi driver who, in 2003, overcome with the need to recognise a neglected history, began a silent vigil with his wife from the Four Courts and the site of Soup Kitchen to the Dublin Docklands. In 2008, Michael Blanch was appointed to a governmental committee to establish a national Memorial Day. The Blanchs are the most Dublin of Dubliners, and yet they embody a rarified transnational commitment to human rights. Mick Blanch took a week of no pay, and without any great reward other than a settling conscience, marked his presence in the simple act of pilgrimage. In a great reclaiming of a national heritage, his niece, Dubliner Ciara Blanch Dunne (9), was the fluent Gaelic-speaker interviewed at the start of the walk. It was the same throughout Canada; the amalgam of civic-minded citizens who scoured the historical record of their towns for oblique references to the passing of the 1847 emigrants, especially through the Orangeman stronghold of Ontario. Celtic crosses now line the Saint Lawrence, erected by voluntary subscriptions. The rightful place of a dispossessed people who long ago helped build Canada is being written into its history. So, too, under the guidance of Caroilin Callery, Strokestown is leading a resurgence in Famine studies, facilitating a deeper understanding of life on an Irish estate in the 19th century, whilst also conjoining a national tragedy with universal themes of exile and emigration. The walkers, oft in costume, stopped at schools and towns along the route, lecturing and extending the lessons of 1847. Strokestown is serving as a homecoming and legitimising of Famine studies, given the funds to support Famine scholarship started not in Ireland, but at Quinnipiac University, Connecticut, where, under the benefactor of the late bagel magnate Murray Lender, the university established Ireland’s Great Hunger Institute and Ireland’s Great Hunger Museum, and amassed the world’s largest collection of paintings, sculptures, and visual arts related to the Famine. We Irish have undoubtedly suffered a great national psychological wound, endured an episode of such extremity that words defy capturing. During the end stages of preparing for the Canadian leg of the journey, while finishing my latest novel, The Death of All Things Seen, I felt a need to connect what was a far-cast story set in North America and Canada to the passage of the emigrant Irish. The closest I came was a vision of the Irish conveyed through the eyes of a Canadian First Nations woman who recalled her ancestors describing the Irish as “a great spawn of new human misery in the portal, wide-eyed coffin ships… skeletal wretches, ragged in the embattled way salmon rush headlong against the current in a death run for the spawning grounds to seed the next generation”. On my return to America, I bought a copy of Sebastian Barry’s celebrated Days Without End, whose protagonist, Thomas McNulty, a Sligo native, had endured and survived the Famine. Intrigued, I was again seeking a deeper understanding of Famine history, and yet what was most revealing in the creation of a character of sustained insight – who, in telling his own story of arrival in America, extends the narrative reach of so many great American novelists in detailing the expansion of the West, the extermination of the Native American and the carnage of the Civil War-was how little McNulty revealed of his Irish past. He says “I’ll say quickly what happened to me and brought me to America, but I don’t feel much in the way of saying too much…” McNulty then gives a summary description of the coffin ships, a truncated, page-long telling, inferior to the reach and insights of his American experiences. And so it goes; our reflexive psychological trauma, that dark indictment of those inhumane years that reduced us to nothing, a historical moment which continues to outstrip even the most eloquent and celebrated of our novelists, and sees us forever bound to and forever recoiling from what befell us. And yet it is for us to make it a subject, to reclaim a voice and deeper understanding of all that passed, to make it a trans-global story that connects with the plight of all those dispossessed of basic human rights. Strokestown Park and The Irish National Famine Museum are quietly doing so.